The Event Horizon slot machine uses the theme of classic casino gambling on a game that’s both modern and vintage simultaneously. Those who like simplistic machines but feel put off by the often-dated feeling offerings of other casino providers might just love what BetSoft have created here. For us, it’s a bit too basic. Its synced reels feature is nice, and the graphics aren’t in any way offensive but lacking additional features, we just couldn’t get that into this one. The one and only gameplay feature is quite cool. It can be very lucrative too with multiple five-of-a-kinds awaiting the luckiest players. Some will no doubt love the simplistic gameplay features. It’s a modern looking machine and there’s definitely a gap in the market for up-to-date titles that offer such “no-nonsense” gaming experiences. Very dull gameplay features. It’s the complete other end of the spectrum from BetSoft’s titles like Dr Jekyll and Mr Hyde. Lack of animations. Betsoft have created some amazing titles in the past that have rich heavily animated sequences. Whereas we’re not expecting that every time, something other than reels and symbols would be nice. Woefully low upper betting limit. Also, why such a bizarre number?! Lucky Sevens = 1,000x the line bet. Liberty Bell = 500x the line bet. BARx3 = 400x the line bet. BARx2, or BAR = 250x the line bet. *Game lists 144,000 credit jackpot available thanks to bonus features. Each time a player takes a spin, two or more reels may become synced. Identical symbols will land on all synced reels. 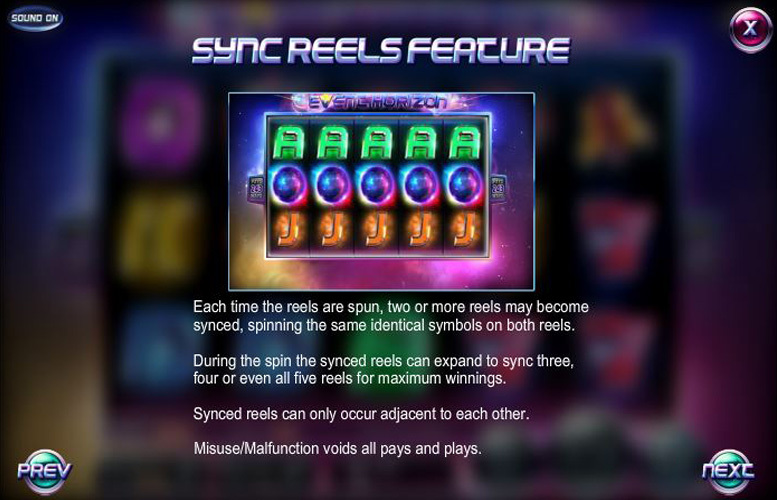 During the spin, the synced reels can expand to sync three, four, or even all five reels for a huge win. Players should note that synced reels can only occur adjacent to each other. 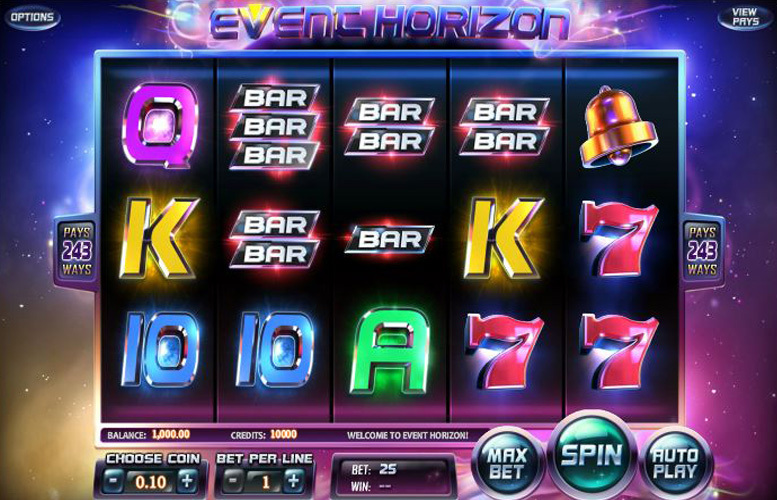 Rather than using pay lines, Event Horizon favours a 243 ways to pay system. Here, any three or more matching symbols in adjacent positions will result in a win. This substantially increases the likelihood of hitting a prize. Cherries, Ace, or King = 40x the line bet. Queen, Jack, or Ten = 25x the line bet. Being as it’s a 243 ways to pay machine, players cannot adjust the number of win lines active at once. It plays as if there are 25 fixed pay lines, however. It’s possible to alter the value of each coin between 2p and 25p, and the number of coins bet per “line”. The highest is five, and lowest one. With all these values set to the minimum, the lowest possible bet is just 50p. Meanwhile, the highest is a bizarre and hugely unimpressive £31.25. Whilst hardly any BetSoft machines cater to high rollers, this figure will even start to irk recreational players who like to bet big too. There’s definitely a market for games like Event Horizon and players who are into a more simplistic experience will likely enjoy it. Whilst it lacks in features, it feels modern and does offer the potential for some big wins thanks to its Synced Reels Feature. 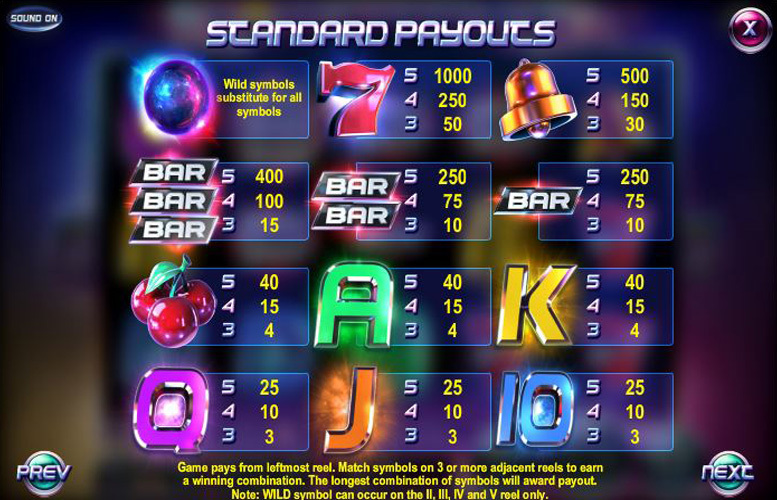 Players will either find it engaging for hours or get bored after about ten spins. This game has a rating of 3 / 5 with 451 total reviews by the users.